October 2, 2017—Local author Tyler Tichelaar will be giving his readers a treat this Halloween season. 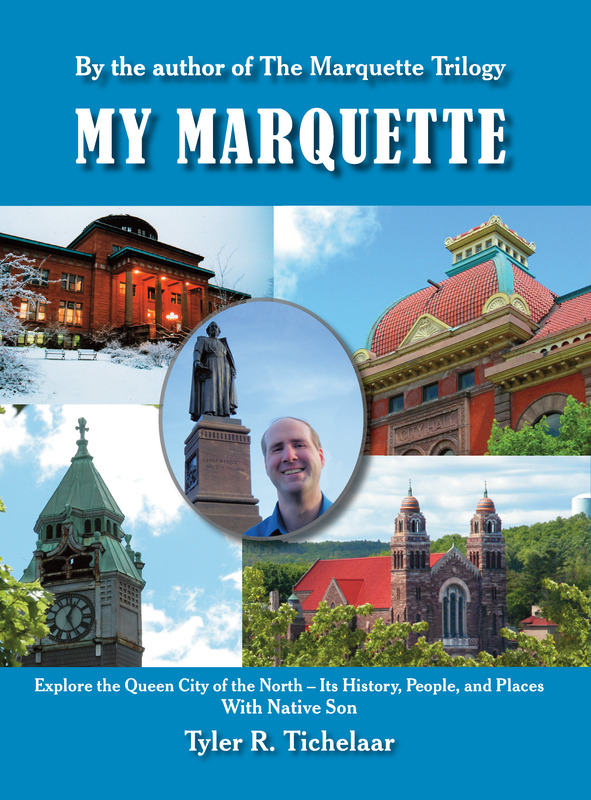 On Wednesday, October 11 at 6:00 p.m. at the Marquette Regional History Center he will be releasing his newest book, Haunted Marquette: Ghost Stories from the Queen City. The book contains more than forty stories of ghosts and paranormal activity within the city of Marquette. Tyler Tichelaar, 7th generation Marquette resident, has spent years collecting stories of Marquette’s hauntings. Haunted Marquette is divided into several sections on hauntings in Marquette’s churches and cemeteries, the downtown businesses, the lakeshore, various houses, and Northern Michigan University. Tichelaar researched each location to determine the likelihood of a haunting there and whether any historical evidence existed to make the haunting plausible. He also interviewed numerous people about their personal experiences with ghosts. Numerous city landmarks are highlighted in the book as locations where ghosts have been sighted, including the former Holy Family Orphanage, Park Cemetery, the Marquette lighthouse, the Landmark Inn, the Peter White Public Library, and the Thomas Fine Arts building at NMU. “Haunted Marquette” highlights more than forty places in Marquette that may be haunted. Tichelaar will release Haunted Marquette at the Marquette Regional History Center on Wednesday, October 11. A presentation will begin at 6:00 p.m. and last about an hour, followed by a book signing. Partial proceeds from the book signing will be donated to the history center. Tyler R. Tichelaar is a seventh generation Marquette resident. He is the author of The Marquette Trilogy, My Marquette, and numerous other books. In 2011, he received the Outstanding Writer Award in the Marquette County Arts Awards, and the Barb H. Kelly Historic Preservation Award. His novel Narrow Lives won the 2008 Reader Views Historical Fiction Award. In 2014, his play Willpower was produced by the Marquette Regional History Center at Kaufman Auditorium. You can learn more at Tichelaar’s website www.MarquetteFiction.com and at the MRHC’s website www.marquettehistory.org. I recently had the good fortune and privilege of getting to visit Middle Island Point, a visit arranged by a friend and with one of the Point’s longtime residents as our tour guide. Because Middle Island Point is private property, you can only access it by invitation and so I will respect the privacy of the residents and not display pictures of their cottages and homes, but the scenery at Middle Island Point is breathtaking enough in itself. 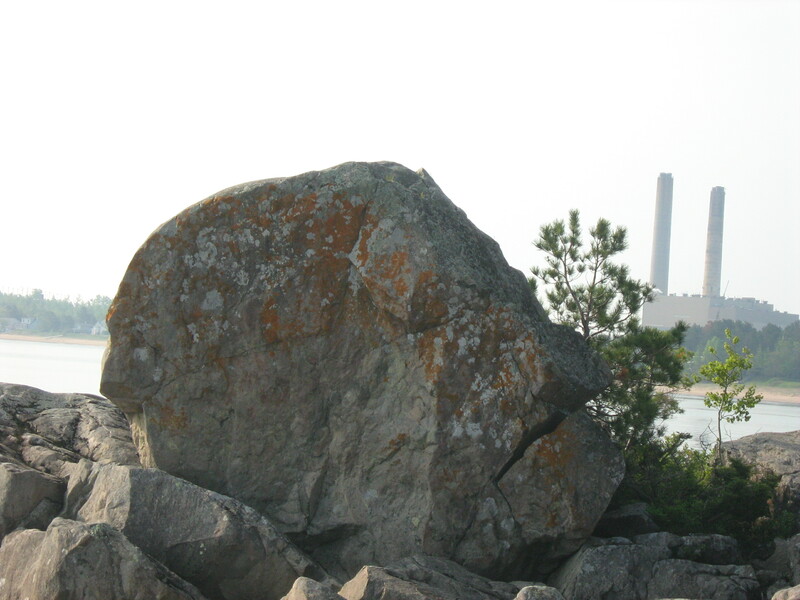 I had long heard of Middle Island Point but never visited it, and when I mentioned it to others, I was surprised that many people didn’t even know where it is. 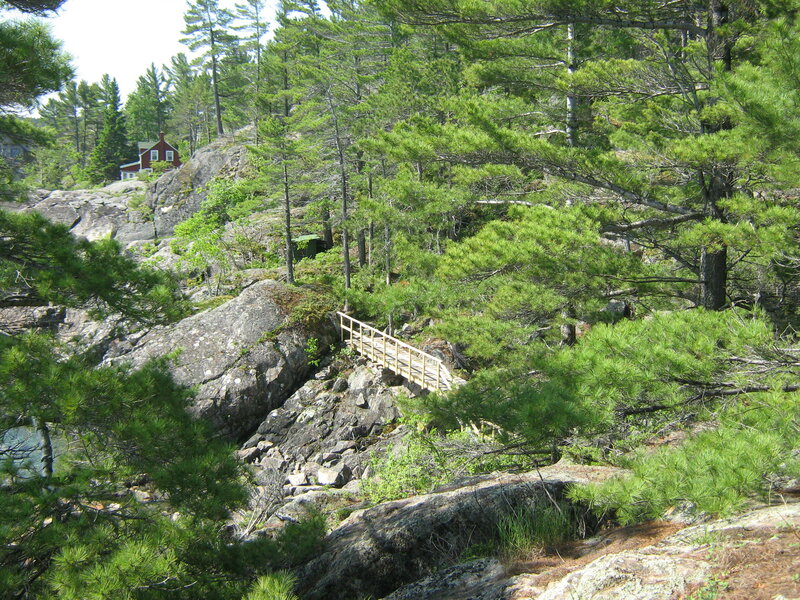 It is actually only a couple of miles from Marquette with access along the Big Bay Road. We have all seen it. When you are at Presque Isle Park and look across the bay from Sunset Point, you are looking straight at it. 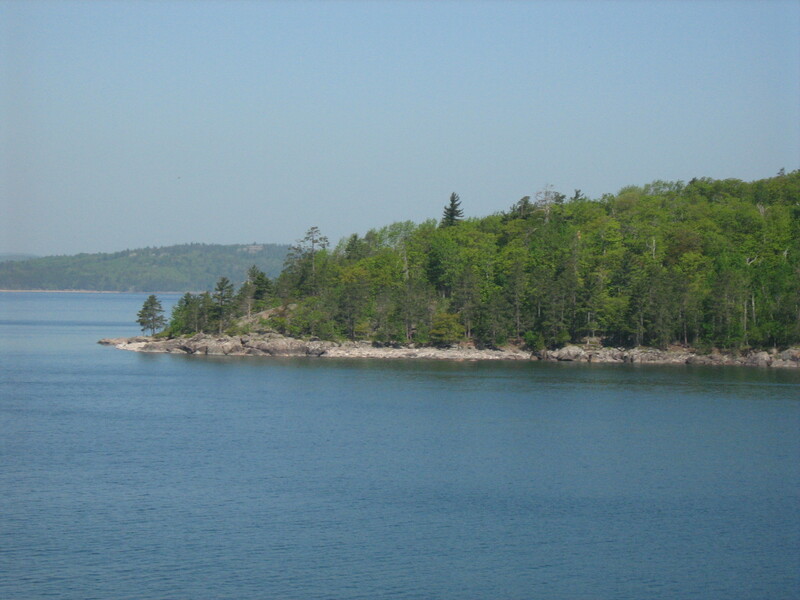 It is called Middle Island Point because a point of the mainland juts out right across from Middle Island (the Middle Island between Presque Isle and Partridge Island). Several books have been written about Middle Island Point, including A History of Middle Island Point(1963) by Robert J. Pearce. The book has an odd cover without any words on it and only an aerial view of the point. Inside it is the history of much of Middle Island Point, including lists of every cottage there. The point itself is quite a rocky precipice jutting into the lake with fairly high cliffs in various places while other parts of the shore are close to the lake. The winter storms can be quite fierce as the waves dash against the rocks, but the geological beauty of the landscape is rivaled by few other parts of the Marquette area’s Lake Superior shoreline. As for its history, Middle Island Point began as a sort of camping getaway for Marquette residents, and its former inhabitants read like a “Who’s Who” of Marquette history. The first cabin was built about 1890 by Mrs. Alice Adams, a milliner in the Harlow Block of Marquette. By the early 1900s, the Point would be filled with cottages on its rocky hill and on the beachside property as well. The Harlow Clark family. They are descendants of Amos and Olive Harlow, Marquette’s founding family. Mr. Harlow Clark, their grandson, reputedly would walk from the streetcar at Presque Isle to Middle Island Point. Forest and Esther Roberts – The Forest Roberts theater was named for Forest, head of NMU’s theatre department, and they were long time owners of a cottage at the point which remains in the family today. 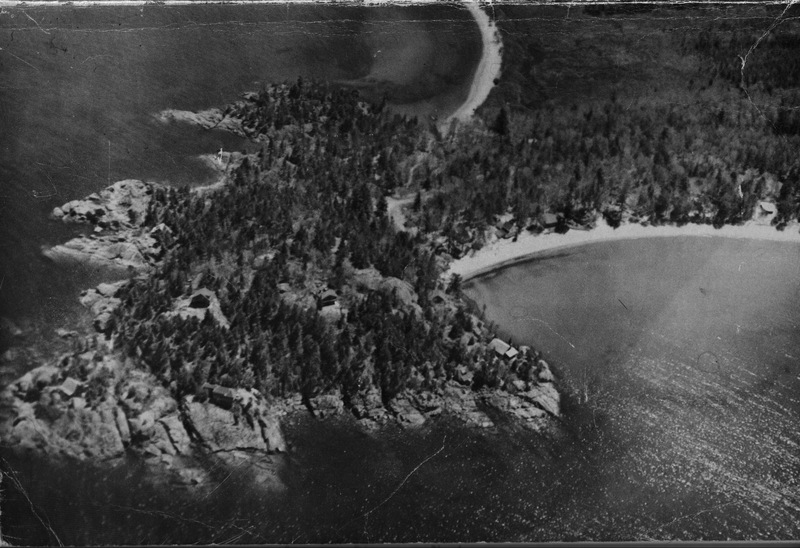 Dorothy Bird – Dorothy Maywood Bird, local author of Granite Harbor and a couple of other books had a cottage along the beach at Middle Island Point. 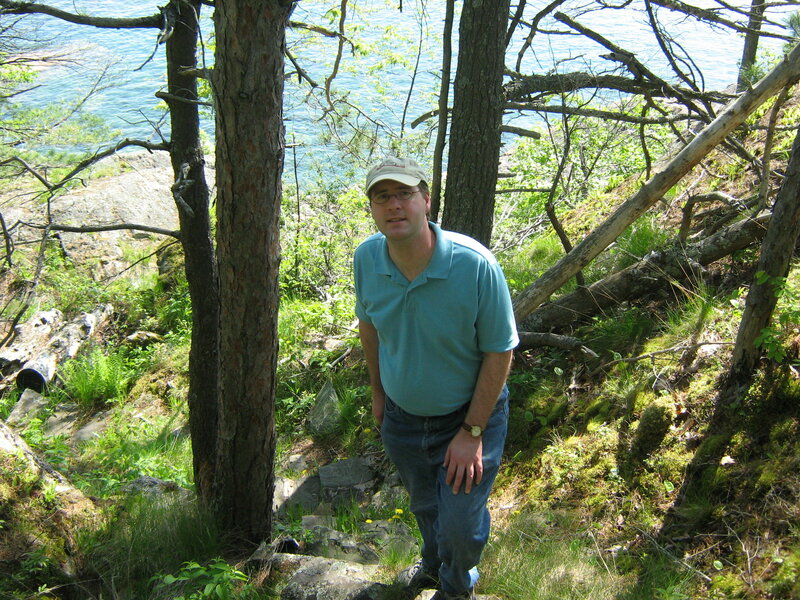 James Cloyd Bowman – the winner of the Newberry Medal for his book Pecos Bill, Bowman was head of NMU’s English Department and had a cottage called Skytop at Middle Island Point. In Ruth Alden Clark Lill’s book Twenties That Didn’t Roar, she recalls being at the cabin when a fire broke out on Middle Island Point. Fortunately, none of the cottages burnt. John Lautner Jr. – the famous architect was a boy who helped to build his family cottage Midgaard here. Lautner would go on to study under Frank Lloyd Wright and build homes for such notables as Bob Hope (watch for the special exhibit on Lautner coming soon to NMU and the Marquette Regional History Center). Famous visitors to the Point include Cole Porter who reputedly had help from a party of guests at the Point in writing the lyrics for one of his songs. The rugged landscape is quite a challenge for the residents, who often have to climb up one or two hills on winding paths from one cabin to another in roundabout ways to get to their own cabins. Cars cannot access the steep hills so groceries, furniture, and anything else needed must be carried up by hand, and often through steps that have been carved by hand into the rocks as well as over wooden bridges. I could go on and on about the history of Middle Island Point, but I hope I’ve whetted your interest enough to explore it further. Pearce’s book is out of print but copies are available at Peter White Public Library. Tyler on one of many winding hillside paths at Middle Island Point. Advisory Committee as the winner of the “Outstanding Writer” award. groups highly qualifies you for this award. A reception will be held in the City of Marquette Arts and Culture Center from 5:30-7 p.m. in conjunction with the Lake Superior Art Association Members Show (on display in the MACC Lower Level Gallery) and Annual Meeting. The award ceremony will take place on Friday May 13 at 7 p.m. in the Community Room of the City of Marquette Arts and Culture Center located in the lower level of the Peter White Public Library. This event is free and open to the public. Please call (906) 228-0472 for more information. THE CITY OF MARQUETTE ARTS AND CULTURE COMMITTEE IS PROUD TO ANNOUNCE THE 15TH ANNUAL 2011 ARTS AND CULTURE RECOGNITION AWARD WINNERS, CELEBRATING EXCELLENCE IN THE ARTS BY HONORING OUTSTANDING MARQUETTE COUNTY CITIZENS AND BUSINESSES. THE AWARD CELEBRATION WILL BE HELD IN CONJUNCTION WITH THE LAKE SUPERIOR ART ASSOCIATION MEMBER SHOW RECEPTION ON FRIDAY MAY 13. The following post is from My Marquette in the section on historical homes and the Carroll Watson Rankin home specifically. Carroll Watson Rankin was the first person to write books set in Marquette, although she changed the name to Lakeville. She is my predecessor who helped to form the beginnings of what is today a flourishing and vibrant UP literature. Local author Carroll Watson Rankin wrote her many novels, beginning with Dandelion Cottage (1904), in this home. Born Caroline Watson in Marquette in 1864, she would later use the male spelling of her name, Carroll, to help her career as an author; she would alternately use other pen names to disguise her gender, but always retained the initials C.W.R. The Rankin home was built in 1877 by Rankin’s mother, Emily Watson, following the death of her husband Jonas Watson. Carroll Watson Rankin would inherit the property and live there with her husband and children. Later, the home would be inherited by her daughter, Phyllis Rankin, long-time librarian at Peter White Public Library. Born in 1864, Carroll Watson Rankin began writing in childhood and published her first short story at age eleven. At sixteen, she became a reporter for the Daily Mining Journal, a job she kept until her marriage in 1886 to Ernest Rankin. The Rankins would have four children, Imogene, Eleanor, Ernest Jr., and Phyllis. While raising her family, Rankin would continue to write and be published in major national magazines including Harpers, Ladies’ Home Journal, Gardening Magazine, Century, Youth’s Companion, and Mother’s Magazine. She was inspired to write her first children’s book, Dandelion Cottage, after her daughter Eleanor complained that she had read all the books ever written for children. The book would be based on a real cottage in Marquette and the antics of Rankin’s daughters and their friends. (More information about the book and cottage is under the section for 440 E. Arch Street). Dandelion Cottage quickly found a publisher and was successful enough that Rankin went on to write many more children’s books. Altogether, three sequels to Dandelion Cottage would be written (The Adopting of Rosa Marie, The Castaways of Pete’s Patch, and The Girls of Highland Hall), as well as the boy’s book Wolf’s Rock and six other novels for children. Today the books are out of print except Dandelion Cottage (published by the Marquette County Historical Society) but copies can still be found at the Peter White Public Library. Carroll Watson Rankin and her son Ernest Jr. also recorded their memories of early Marquette, which are available as an unpublished manuscript at Peter White Public Library. I am sure Rankin would appreciate that her own memory lives on in Marquette as does the small cottage she made famous. Copies of Dandelion Cottage continue to sell as generation after generation falls in love with the charming story. Like their mother, the Rankin children would contribute a great deal to Marquette. Phyllis Rankin would be the head librarian at Peter White Public Library for over forty years and be well known for promoting reading in the community, especially to children. Ernest Rankin Jr., as a member of the Marquette County Historical Society, would do much to preserve the area’s history. Imogene would marry and move away but return later to Marquette. 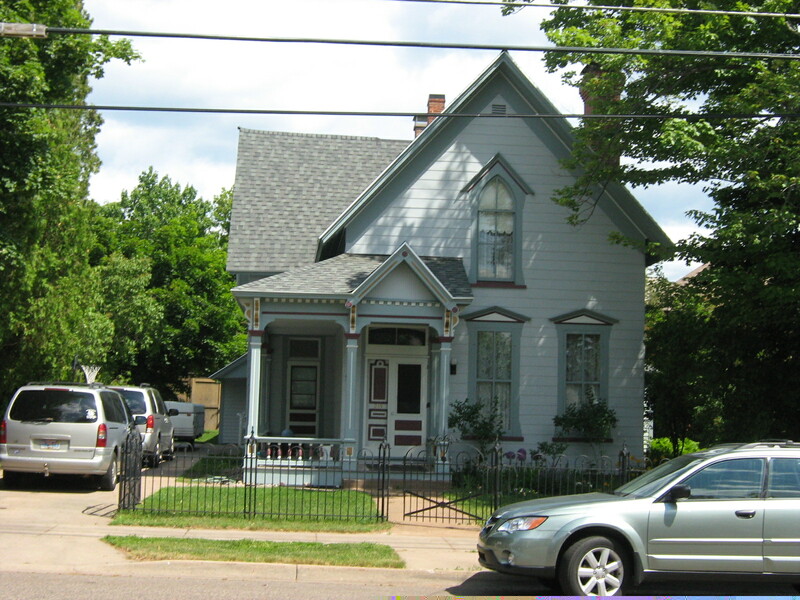 (For more information about Imogene, see the section on 209 E. Arch Street in My Marquette as well as more information on the real Dandelion Cottage and the book it inspired). Helen and I started up the library’s high front steps. Although the current impressive and beloved library building was built in 1903 and opened its doors the following year, Marquette’s first library began not long after the town’s founding. In Iron Pioneers, several of the female characters early on form the Ladies’ Literary Society, an early book club as well as a sign of social distinction in some of its members’ eyes. Although this group was fictional, reading clubs, especially among women, were common in the nineteenth century, and such groups often were the proponents of building libraries. Marquette did have a literary society as early as 1856, and a lending library existed soon after on Baraga Avenue. This lending library was destroyed by the 1868 fire. In the 1870s the library, which belonged to the Marquette school system, was downtown in the Coles Block. At the time, Peter White also had his own personal library collection that he loaned out, so when he built the new First National Bank on Front and Spring Streets, he allowed the library to relocate there in 1878 and merge its collection with his own. Later, in need of more space, the library moved to a room in the City Hall. By 1891, the library’s collection had grown to the point of needing a new home, which it found on the Thurber Block, where Book World is currently located. Because Peter White donated this building, the library was named in his honor. This new building was also soon found to be too small. Peter White then tried to convince Andrew Carnegie to fund a new library in Marquette—Carnegie would do so for nearby Ishpeming—but Carnegie replied that Marquette was Peter White’s city, so Peter White once again took up the challenge to play benefactor to Marquette and fundraising efforts began. John M. Longyear donated the land for the new building and Peter White and Samuel Kaufman donated most of the money. 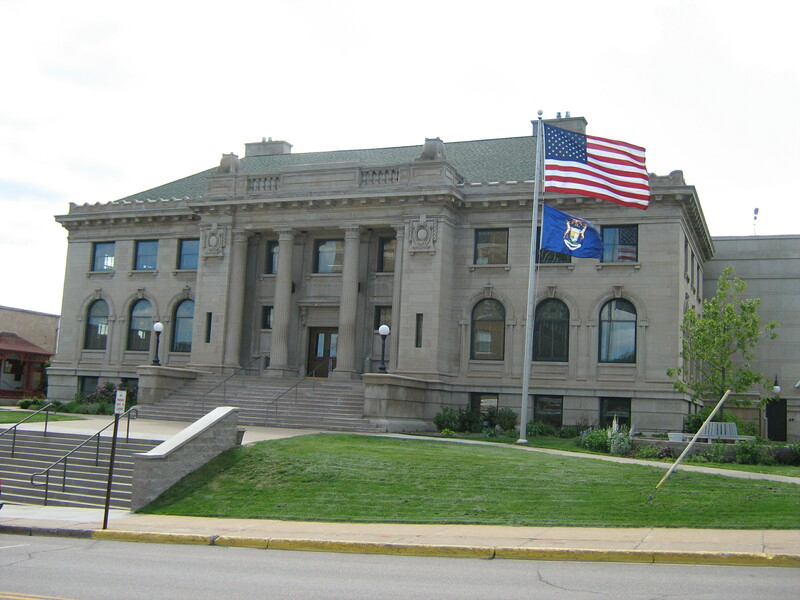 In 1904, the new library was officially dedicated and opened on the same day as the new courthouse. The impressive limestone structure, with its large pillars and situated on top of Front Street’s hill, resembled a Greek Temple of Knowledge. Complete with a downstairs smoking room for men, the new library had three floors and seemed plenty spacious for the book collection. But within fifty years, the collection again outgrew its space. Increased use by patrons and 70,000 volumes led to building an annex on the back of the library in 1957, which included the Children’s Room and storage for most of the adult fiction and the phonograph record collection as well as a large downstairs room for films, puppet shows, and book sales. This version of the library is the one I would know throughout my childhood. But the people of Marquette soon wanted still more from the library. Far beyond just being a place to check out books, Peter White Public Library was becoming the cultural center of Marquette and a new library was needed to reflect this change. Residents’ affection for the original building was too great to destroy it, so instead, in the late 1990s, the annex was removed and a new addition created which would gracefully blend in with the architecture of the original building. The remodeling would result in the library building being closed for two years and its collection being housed in dormitories at Northern Michigan University where patrons could still access it. Then in 2001, the new library was opened. The public could not have been happier. The original building was completely retained, and it includes two large reading rooms upstairs, two more reading rooms downstairs, and an art gallery. The new addition, besides containing a collection well surpassing 100,000 volumes, also houses an enormous children’s room, a café, a community room, a gift shop, and the Marquette Arts and Culture Center’s exhibits and space for its art and other cultural classes. In addition, the library’s film and music collection had ample room, and the Rachel Spear bell collection was given prominent display. The Peter White Public Library is hands down my favorite place in Marquette. I began visiting it first with my preschool class—we would go on “field trips” there just across the street from the First Presbyterian Church to see movies and puppet shows. After preschool, my library visits were rare because until about 1980, the library’s bookmobile would bring books to the outlying townships. The bookmobile arrived in my neighborhood of Stonegate at the Crossroads about 3:30pm every other week just as the school bus brought us home. We would quickly leave the bus and rush to the bookmobile where Ruth Lee, the driver-librarian, would patiently let us kids dig through the books while she chatted with our parents. I brought home many, many books from the bookmobile including Where the Wild Things Are and numerous of the Bible story rhyming Arch books. But my absolute favorite, which I checked out countless times, was George and Martha, about two hippopotamuses whose friendship usually results in Martha teaching George a lesson, such as just to tell her he doesn’t like split pea soup rather than hiding it in his loafers, or not to be a Peeping Tom by whacking him over the head with the bathtub. As an adult, I still find George and Martha hilarious as well as a wonderful way to teach children basic manners. About the time I was in fourth grade, funding for the bookmobile was cut so my mom started taking my brother and me to the library. We were only allowed in the children’s room where we would get to visit with our cousin, Merrie Johnson, who worked there. Always a favorite with the kids, Merrie retired in 2005 after more than thirty years at the library; a huge retirement party was held for her in the community room. As a child, my favorite books to check out included Andrew Lang’s colored fairy tale books and copies of the Wizard of Oz series. As I got older, I discovered the Rainbow Classics, published mostly in the 1940s and edited by May Lamberton Becker—I think I loved them mainly because they were old and they had wonderful colored illustrations, but they also infused a love of literature in me as I graduated from Andersen’s Fairy Tales to Little Men to Jane Eyre and Wuthering Heights. After reading one Rainbow Classic, I would scan the list on its back cover to pick out another until I had read them all, and then I sought out more classics. By the time I was fourteen and allowed into the library’s adult section, I was ready to gobble up Agatha Christie mysteries, and more classics—Charles Dickens, the Bronte sisters, Mark Twain, and Jane Austen. Of course, it would have been impossible not to mention the library in my novels. In Iron Pioneers, Edna Whitman is an early librarian and mourns the library’s loss in the 1868 fire. In The Only Thing That Lasts, Robert O’Neill is enthusiastic about his first visit to the library and impressed by its classic architecture. In The Queen City, Kathy McCarey is at the library when she hears Peter White has died. As for me, today at least once a week I can be found at the library, checking out a book, CD, or video, attending a film—the annual Bollywood film night is a highlight of the winter season—or just admiring the latest art exhibit. As an author, I’m pleased that my books are in the library’s collection, and I’ve gotten to know many of the librarians over the years as I’ve participated in different library events and helped to plan the Upper Peninsula Publisher and Authors Association’s conferences that have been held there. The library staff is wonderful, enthusiastic, and ever ready to support the arts and the community. The building and people have made Peter White Public Library the true cultural center of Marquette. Every library patron knows how lucky Marquette is to have such a wonderful library that far outshines those in most metropolitan communities, and visitors to our city never cease to rave about it. A large bust of Peter White sits across from the circulation desk. At Christmas, he dons a festive holiday hat or Santa’s cap. Knowing Peter White’s sense of humor, I’m sure he enjoys all the festivities and the people who pass him each day. His generosity in funding the library has truly been the gift that keeps on giving to the community.